I’ve never really celebrated Throwback Thursday (#tbt for those of you on the social networks), but I thought this was a good time to start. Our feline ancestors have been around since the parks opened (see my About page for more information), so we’ve seen a lot through the years. One of my relatives loved the Skyway back when it was in operation, running between Fantasyland and Tomorrowland. 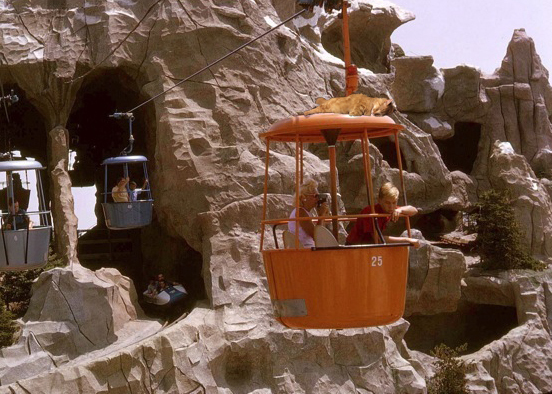 I recently came across this picture that shows how we cats most enjoyed riding this classic attraction. From high above Disneyland, the cats of yore could keep an eye out for any rodents who may have found sneaky hiding places. We also had the ability to use the buckets as a sort of hop-on, hop-off transportation service if we wanted to unload inside the Matterhorn to visit the Yeti or jump down onto the roof of our favorite dark ride. Humans were rarely clever enough to notice when one of us was riding atop a bucket, but a cat named Philonous did spend most of the ’70s meowing ominously at tourists while the ride was en route. He was careful always to hide before the bucket reached a station, however, so the attraction garnered something of a reputation for being haunted. The 1982 Disneyland Cat Olympics actually featured an event in which the contestants jumped from one Skyway bucket to another. The tuna medal was taken by the competitor from Tomorrowland, but the other cat athletes cried foul (claiming he’d had an unfair advantage). It was quite the scandal and much fur was shed that fateful day. When the Skyway was closed in 1994, we held a massive meow-in as our way of protesting. Unfortunately, we cats aren’t well known for our commitment to causes, and most of the protesters were easily distracted by tuna within a matter of days. Even after the actual attraction was demolished, the Skyway Chalet in Fantasyland has remained one of the most popular cat hangouts for two decades. Rumors keep swirling that it is on the chopping block, but I’m convinced the humans are too scared to uproot so many kitties from their dens. You’ll notice that the structure is still standing even though it was “supposed” to come down more than six months ago. Rode the one in Walt Disney world before they took that one down. Didn’t see any kitties riding it ,though! Wish I had….